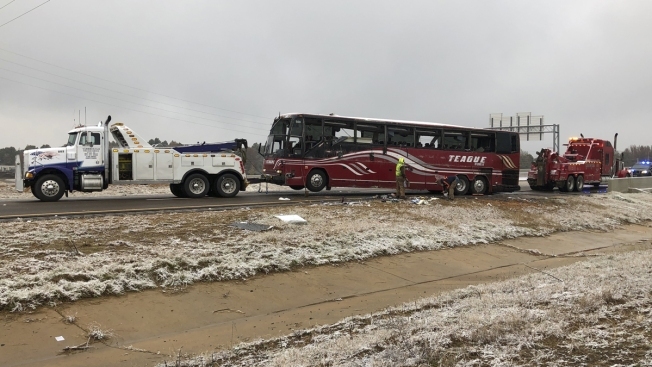 A winter weather advisory covered more than 89 million people up the East Coast from Washington, D.C.
A tour bus is towed away Wednesday, Nov. 14, 2018, after it overturned on an icy highway in northern Mississippi. DeSoto County sheriff's deputy Alex Coker said the tour bus carrying about 50 people overturned just after midday Wednesday south of Memphis, Tennessee. A pre-winter storm was being blamed for five deaths as it spread icy conditions on roads in the South and Midwest on Wednesday before it hits the Northeast Thursday, NBC News reported. Two people were killed and several dozen hurt when a tour bus headed to a casino overturned in Mississippi. In Arkansas, three people died in separate crashes on icy roads, prompting authorities to shut Interstate 40 overnight. A winter weather advisory covered more than 89 million people up the East Coast from Washington, D.C., as officials prepared for storm damage. Tens of thousands of people were without power in Kentucky, Indiana and Ohio.